This free app gives you the inside scoop on special offers, great events and local restaurants, attractions and businesses. 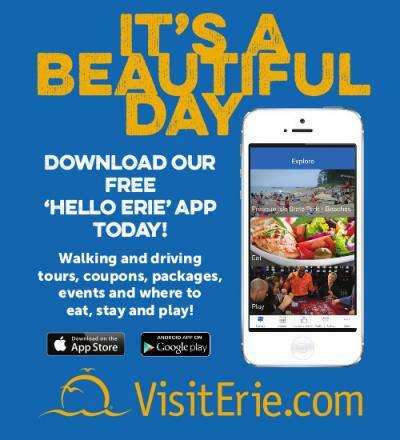 The new “Hello Erie” app is your complete Erie tour guide. With features such as an Eat, Stay, Play Directory, calendar of events, turn-by-turn directions and a one-touch “Call” button for each attraction to help you get the most out of your stay. Search for restaurants, hotels, and attractions with easy to navigate categories or use the map feature to find what is closest to you. Special offers on attractions will help you save money and have a memorable trip. 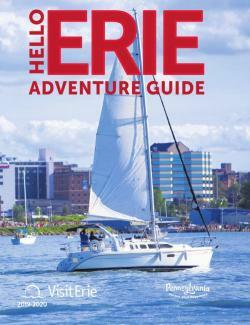 With turn-by-turn directions to all Erie destinations, you can make the most out of your trip with easy navigation. Check out the calendar to learn about local events and special activities to enjoy during your visit. 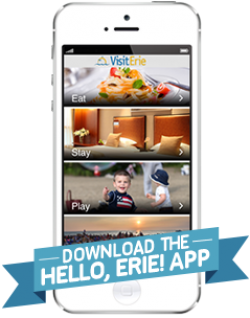 VisitErie is Erie County’s leading tourism promotion agency. Erie is Pennsylvania’s only Great Lakes Port City featuring Presque Isle State Park, shopping, dining, wineries, amusement and water parks, theaters, zoos and museums. Come stay with us for a week or a weekend. VisitErie is just a short drive away to convenient affordable family fun.